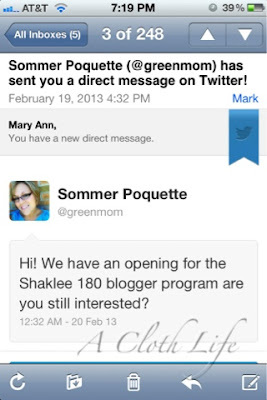 A Cloth Life: I am a Shaklee180™ Blogger!!!! Yesterday I got some pretty amazing news - a space opened up and I have been given the opportunity to be a Shaklee 180™ blogger! This is a 6 month campaign that over 450 bloggers applied for and only 90 were chosen to participate in. Shaklee 180™ is a program designed to help you lose weight using natural products, healthy eating habits, and regular exercise. Starting March 1st, you'll get to follow along as I document my (HOPEFULLY) successful journey via blog posts, pictures and VIDEOS. I didn't know just how much I wanted to be a part of this until the official announcement was made last week, and I wasn't included. Lucky for me, a spot opened up and here I am! I am incredibly excited for this opportunity on so many levels. All my attempts to lose weight for the past year have been for naught, and I am so done with feeling tired and overweight. I'm a little scared and anxious that I might not do well. I might fail. Having this extra support system in place now gives me added confidence. Plus? It's a contest. One of these lucky ladies (myself included!) is going to win $$$! $2,500 and a weekend spa trip? Yes please! Getting healthy, slimming down, creating healthier habits for myself and my family? Amazing! Please, no one call me and tell me this was a mistake! It still feels completely unreal. This is a sponsored post as part of the Shaklee Corporation blogger program. I have received free products, online support and incentives for participating. My opinions are my own. Congratulations! That is awesome! So happy for you! Congratulations! What a great opportunity! Rooting for you! Yes! Thank you! I really didn't think I knew there was a chance they'd need replacements, but honestly didn't think they could possibly choose me. I am over the moon! Definitely not a mistake! I can't wait to see how many inches/pounds we all lose! Congratulations! This is SO exciting! I'm really looking forward to reading about your progress- I'm definitely intrigued by this program! Ooooh, how exciting! Congratulations for being selected!! I'll have to look into the Shaklee 180 program for weight loss. Just this morning I was thinking I had plenty of time to get started on this New Year's resolution of mine to lose weight...and it's almost MARCH! GAH! Thank you! I am super excited! (obviously haha) It seems like a really great program, and I am super excited to be able to test it out. I definitely have been needing some kind of boost to help me lose some weight!